The leaves are turning red on the maple trees outside, we turned our clocks back an hour, and on a lazy Sunday afternoon I just want to take naps and stay in bed to keep warm. Those are signs that the chilly weather of fall is upon us. With one more week to go of tomatoes, it's time to make some delicious warm tomato soup to close out the tomato season. This is a recipe from my good friend Chef Nichole Mayer. She writes an amazing blog - No One Trusts Skinny Chef, where she shows us amazing and delicious healthy ways of cooking. The recipe is her Roasted Tomato Soup with Srirachup as the spicy topper. Enjoy! 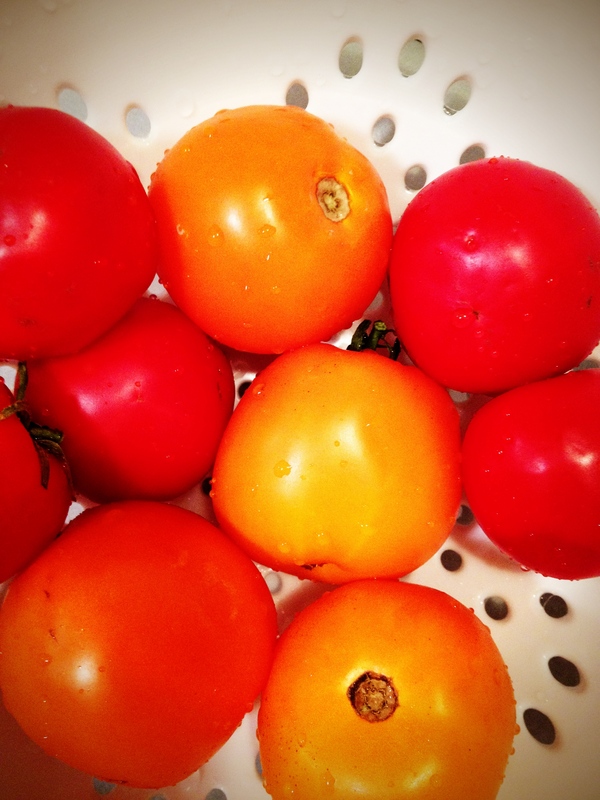 This is my favorite time of year – end of summer beginning of fall: tomato season. You say tomato, I say tomato soup. In a bittersweet twist, gone are the days when I dip a grilled cheese sandwich in a steaming bowl of this sweet and tangy goodness. Gone. Way gone. So gone. These days, my skin seems to prefer a chunkier version of the broth-y classic. I like to load up on various toppings, mix them in and enjoy a hearty bowl of soup. This roasted version is just that – small chunks of roasted veggies – topped with MORE roasted tomatoes, goat cheese (troublesome skin friendly cheese option), scallions, nutritional yeast (remember that), and a spoonful of sirachup. You heard me, sriarcha + ketchup = srirachup. A spoonful to finish off this soup is just the right amount of spice to kick things up a bit. My good friends at Sosu ketchup knew exactly what they were doing (magic) when they came up with the winning combination. They were also the very generous souls who gave me the tomatoes that I used to make this soup. Picked them up fresh from their kitchen – urban farming! 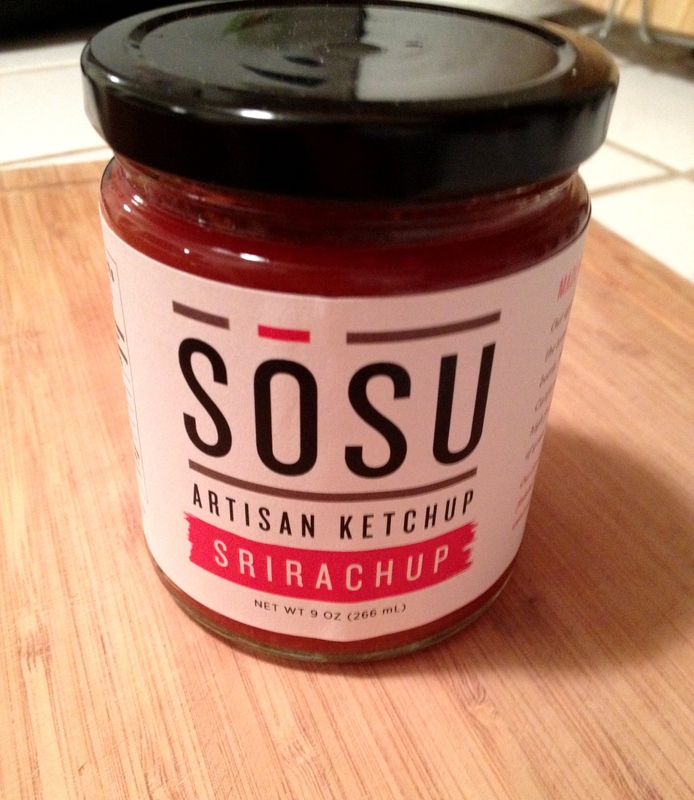 You can find their all-natural artisan ketchups here: www.sosuketchup.com or very soon at a farmers market near me (San Francisco). Why you should eat this? Tomatoes, guys: they’re like really good for you. Such a pretty fruit. Loaded with so many good things – let us (and my limited attention span) focus on just one. Antioxidants. Vitamin C, E, and beta- carotene. Antioxidant super stars. Why are antioxidants so important? Let’s get science-y. Oxidation from our everyday environments can produce free radicals. The free radicals (bad guys) can cause chain reactions in your cells that will harm or kill them. Antioxidants (good guys) step in by terminating the chain reactions and helping to prevent damage to your cells. This is a very basic explanation, but just know that tomatoes are not the ‘fountain of youth’ – maybe like a ‘slow leak to a more youthful you’. Eat tomatoes, guys. Right now while they are at their taste/nutrition peak! 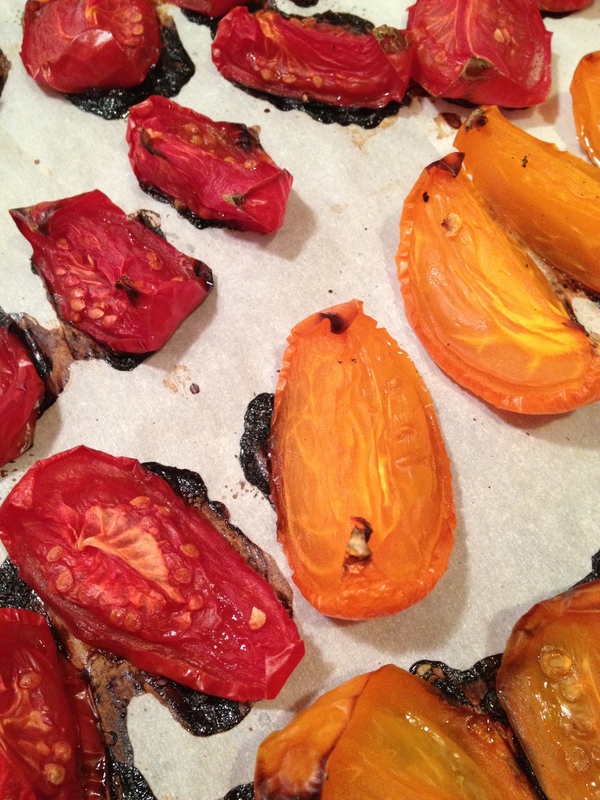 Line two baking sheets with parchment paper or if you’d like – rub pans down with olive oil. 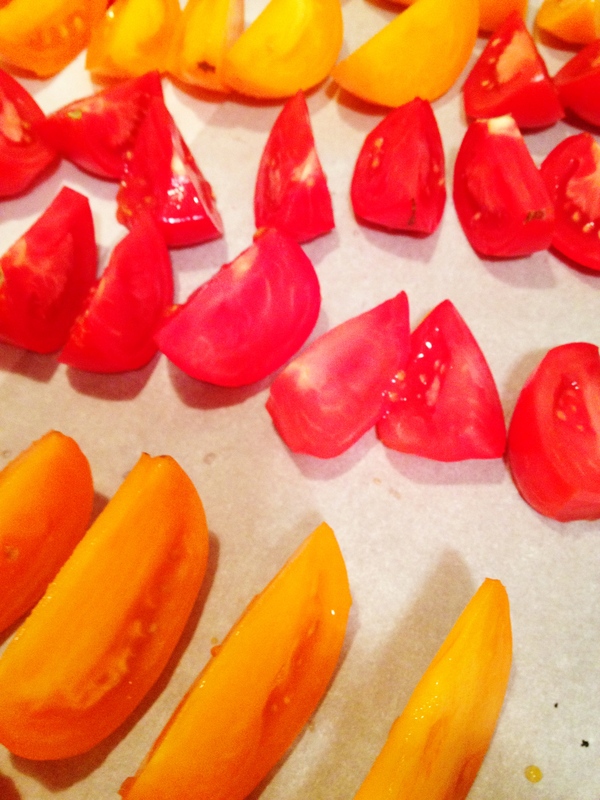 Arrange the tomatoes, skin side down, on a baking sheet. Coat the bell pepper and onions with olive oil and put them on the other baking sheet along with the garlic (UNPEELED), place the pepper skin side down as well. Give both baking sheets a sprinkle of salt. 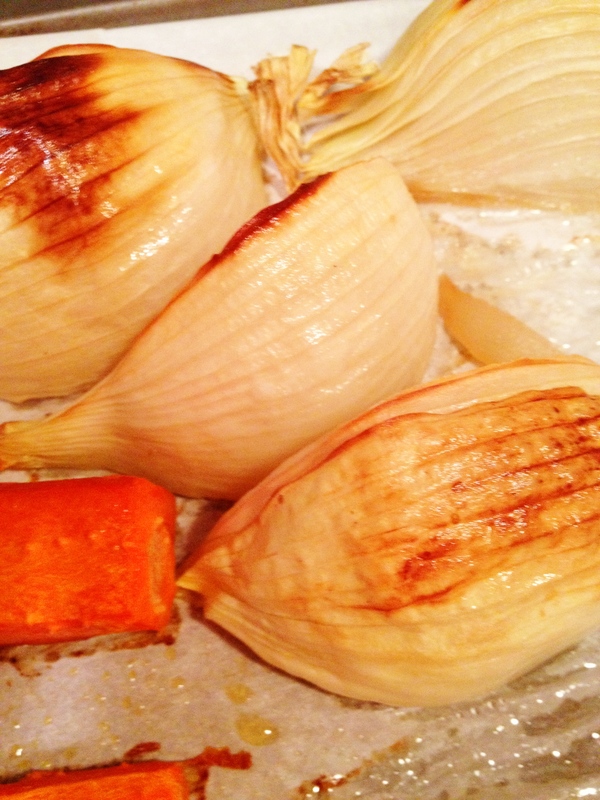 Bake until onions get a bit of brown (you can turn them if you feel like they are getting too brown)…. and the tomatoes start to collapse a bit, about 45 minutes to an hour. 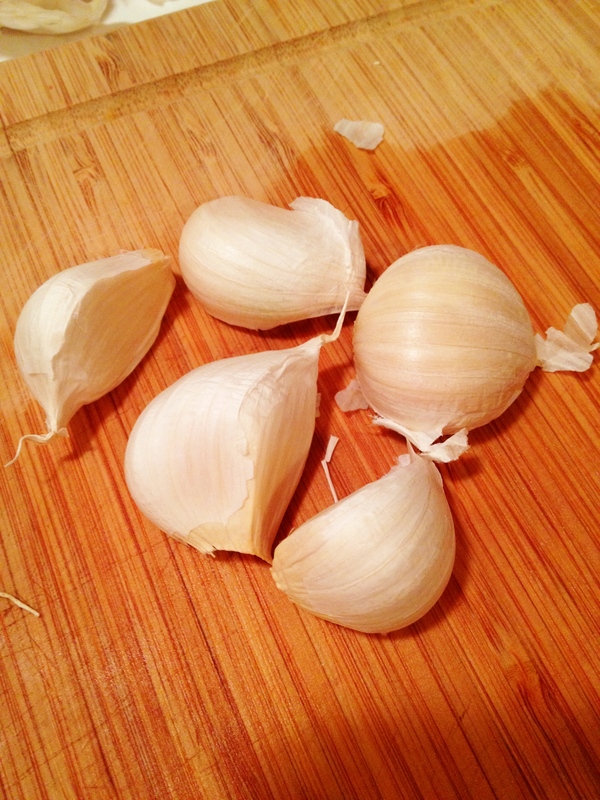 Be careful to check on the garlic here, if they are getting brown and a super soft by now, pull them from the oven. 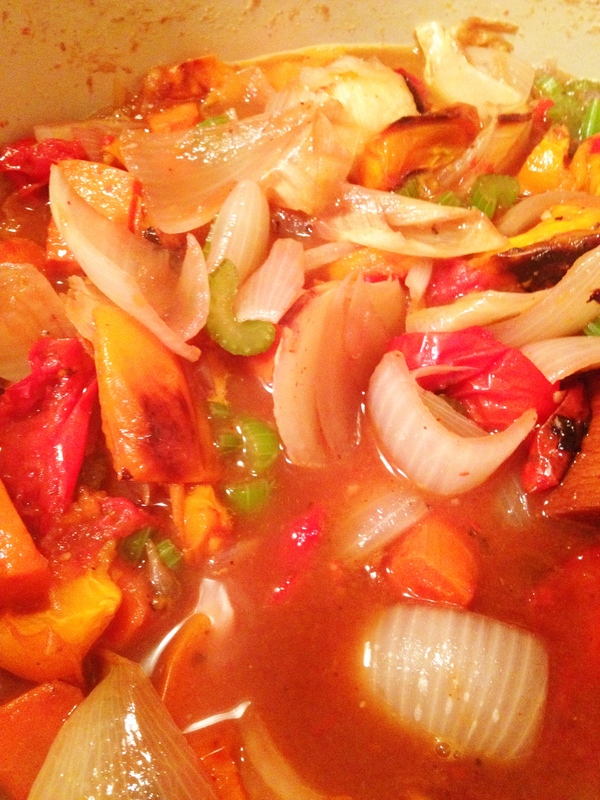 Peel the garlic, dump all of the roasted vegetables (set aside some of the tomatoes to top the soup with. Do it! They are like candy at this point) into a big pot, and puree with a hand blender. You can also use a conventional blender or food processor and work in batches. Blend in a cup of the stock, and keep adding the rest 1/2 cup at a time until the soup is the desired consistency.I like a chunk and texture to this soup, but smooth or chunky is your call. If the soup is not in a pot, add to a big pot and heat it back to a boil. Serve in big bowls. Add the nutritional yeast (if you like) and srirachup or your favorite hot sauce – adjusting it to your taste. Top with goat cheese, reserved roasted tomatoes, and scallions. Maybe a big green salad on the side.